The candidates need to apply for the fully funded UTRIP summer internship in Japan 2019. The University of Tokyo offers the UTRIP scholarship in Japan. The UTRIP 2019 scholarship is the fully funded and all costs will be covered in Japan Internship program. At this stage, passport is not demanded from the students. UTRIP stands for University of Tokyo Research Internship program, Science Internship in Tokyo, which has the duration of 6 weeks. The students from all over the world can apply as they are considered eligible for this Japan Internship scholarship program. The students should enjoy the summer internship program Japan. This program is paid internship in Japan and the internship Japan for international students is the wonderful opportunity for the international students to complete their summer internship in Japan and they will make their future career better. The undergraduate students apply for UTRIP internship in Japan. 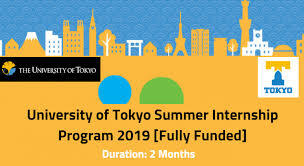 This scholarship programs invites the undergraduate students from across the world to get the practical experience at University of Tokyo before start the MS or PhD degree in future and experience the forefront of research at the leading laboratory. This UTRIP summer internship scholarship program in Japan will continue for 6 weeks. The dates are mentioned below and you can select any date. June 13 to July 24, 2019, for 1st Crew students. June 27 to August 7, 2019, for 2nd Crew students. The candidates must have completed at least one full year in a Bachelor’s degree program at the time of application. The students be enrolled in and after finishing of UTRIP program, be expected to return to another semester, quarter or another equivalent academic term, in a Bachelor’s degree program. The applicants in their third year of four-year Bachelor’s degree program & in their second year of three-year Bachelor’s degree program. Second-year students in four-year Bachelor’s degree programs are also encouraged to apply. The students be enrolled in natural science or related field. Physics, Astronomy, Earth & Planetary Science, Chemistry, Biological Sciences. 1. The students, who got English medium education for past 8 years, they are exempted from submission of English proficiency test scores. They can submit the English proficiency certificate. 2. The test scores of TOEFL or the equivalent English proficiency test like IELTS are needed, if English is not your first language. The last date to Apply for UTRIP Summer Internship in Japan 2019 is 10 January 2019, according to the Japan Standard Time (GMT+0900). The candidates will have to complete an Online Application Form. All required documents are required to be submitted Online and incomplete application form will not be entertained. The Link of Online Application Form is given below in Red Color. Please Must Read Official Advertisement for More In depth Details.